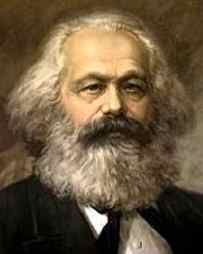 Karl Marx was born on May 5th, 1818 in Trier, Germany (then Prussia), the son of Hirschel and Henrietta Marx. Hirschel abandoned his Jewish faith when Karl was a child in order to escape the Anti-Semitism that ran rampant through Germany. He became a Protestant, going so far as to change his name from to Heinrich. Karl attended school locally until 1835, at which time he entered Bonn University to study law. He ran up large debts and was wounded in a duel. In an attempt to help his son set his life straight, Heinrich paid off Karl's debts, but insisted that he move to Berlin University. Karl earned his degree at Jena in 1841 at the age of twenty-three. He moved to Paris in 1843, where he met Frederick Engels. Frederick Engels was born on November 28th, 1820 in Barmen, Germany (then Rhineland), the son of a manufacturer. Engels was educated locally at schools run by Protestant Pietists ("a reform movement in the German Lutheran Church during the 17th and 18th centuries, which strove to renew the devotional ideal in the Protestant religion"). Engels was sent to Bremen in 1838 to work as a clerk. He completed his education by reading voraciously, studying philosophy, theology, history, and literature. He published articles under the pseudonym "Friedrich Oswald." In 1843, on his way from England back to Germany, Engels met Marx. In 1850 Engels went back to England to run the factory that had been his father's. He hoped that he could financially support Marx with the money from the mill. Marx also settled in London after being expelled from Brussels, working on Das Kapital and playing an active part in the International Working Men's Association. Marx died in Hampstead in 1883. Engels spent the rest of his life getting the rest of Das Kapital published. Volume Two of Capital was published in 1885 and Volume Three, in 1894. Engels died on August 5th, 1895. A doctrine written by Marx and Engels describing the beliefs of the Communist League.